Biocompatible poly-[N-(2-hydroxyethyl)-d,l-aspartamide]-methoxypoly(ethyleneglycol)-hexadecylamine (PHEA-mPEG-C16) conjugated with 1,4,7,10-tetraazacyclododecan-1,4,7,10-tetraacetic acid-gadolinium (DOTA-Gd) via ethylenediamine (ED) was synthesized as a magnetic resonance imaging (MRI) contrast agent. Amphiphilic PHEA-mPEG-C16-ED-DOTA-Gd forms micelle in aqueous solution. All the synthesized materials were characterized by proton nuclear magnetic resonance (1H NMR). Micelle size and shape were examined by dynamic light scattering (DLS) and atomic force microscopy (AFM). Micelles with PHEA-mPEG-C16-ED-DOTA-Gd showed higher relaxivities than the commercially available gadolinium contrast agent. Moreover, the signal intensity of a rabbit liver was effectively increased after intravenous injection of PHEA-mPEG-C16-ED-DOTA-Gd. Magnetic resonance imaging (MRI) is one of the most impressive non-invasive imaging modality for diagnosis [1, 2]. MRI is based on the nuclear magnetic resonance (NMR) signal generated by hydrogen nuclei of water molecules and its changes that are dependent on the water distribution in tissues. MRI contrast agents improve diagnostic accuracy by providing physiological information along with the exquisitely high anatomic detail [3, 4]. In general, contrast agents consist of a paramagnetic metal center, typically gadolinium (III), which must be chelated with an appropriate ligand molecule, since the free metal ions are toxic at quantity required for diagnosis [5, 6]. Gd(III) diethylenetriaminepentaacetic acid (Gd(III)DTPA) and Gd(III) 1,4,7,10-tetraazacyclododecan-1,4,7,10-tetraacetic acid (Gd(III)DOTA) are clinically used as contrast agents due to their thermodynamic stability . Among Gd-chelate complexes, it has been known that the Gd-DOTA complex has much greater stability than Gd-DTPA in physiological conditions. The half-life of Gd-DOTA is estimated to be over 1,000 years at pH 7.4 [8, 9]. However, these low molecular weight contrast agents cannot distinguish effectively disease tissues from normal tissues . In recent years, contrast agents with improved characteristics, such as increased efficacy and organ specificity, have been developed. Several approaches to slow the rotational motion of gadolinium-based contrast agents and thus to improve their relaxation efficiency have been reported in the literature. Macromolecular Gd complexes have been developed by conjugating these Gd chelates to biocompatible polymer such as dendrimers , linear polymers [12–14], or proteins [15, 16] for exhibition of more effective relaxation as well as prolongation of their intravascular retention time . For these purposes, various hydrophobic groups have been introduced into the DTPA molecule through amidation of monoacid tetraester DTPA derivatives. The paramagnetic complexes of these compounds have been studied for the detection of tumors and myocardinal infections. In addition, incorporation of certain amphiphilic gadolinium(III) complexes into liposomes showed enhanced proton relaxibility [18, 19]. Another interesting strategy for the development of new types of macromolecular contrast reagents is the synthesis of amphiphilic gadolinium(III) complexes that can form spontaneously micelles [20, 21]. We recently synthesized biocompatible amphiphilic derivatives of DOTA with hydrophobic alkyl chains, whose gadolinium(III) were incorporated into DOTA of micelles. The resulting micelles showed an increase in relaxibility relative to DOTA-Gd (Omniscan®) because of the lower mobility of the paramagnetic complex inside micelles. Polymeric micelles very promising for MRI contrast agents. Because the polymeric micelles is an associate of many block copolymer chains, block copolymers with well-controlled molecular weight can be excreted through kidney filtration after dissociation of the polymeric micelles into block copolymer chains. Therefore, a low risk of chronic toxicity is expected to present itself and is expected to stem from polymeric micelles complete excretion over a long time period. In addition, micelles are known to mimic the phospholipid structure of the membranes and hence can be good candidates as hepatocyte-specific agents . Polyhydroxyethylaspartamide (PHEA) is a synthetic polymer having protein-like structure, obtained by the reaction of ethanolamine with polysuccinimide (PSI), itself prepared by thermal polycondensation of d,l-aspartic acid. PHEA has good biopharmaceutical properties as drug carrier such as high water solubility, multifunctionality, and low cost of production [23–29]. In this paper, we synthesized amphiphilic graft derivatives of PHEA by the introduction of hydrophobic hexadecylamine (C16) and using ethylenediamine (ED) as a linker of DOTA-Gd. DOTA was conjugated to PHEA-mPEG-C16-ED, and then Gd was chelated to the PHEA-mPEG-C16-ED-DOTA. MR contrast enhancing ability of PHEA-mPEG-C16-ED-DOTA-Gd was investigated in vitro and in vivo. The synthesized graft amphiphilic copolymers have demonstrated to form polymeric micelles in aqueous solution with 180 nm. Polysuccinimide (Baypure DSP®, PSI, 8,190 g/mol) was purchased from Lanxess Co., Ltd, Germany. Methoxypoly(ethylene glycol)-amine [mPEG-NH2, number-average molecular weight (Mn) ≈ 5,000] was purchased from SunBio Inc., Korea. 1-Hexadecylamine (C16–NH2), gadolinium chloride hexahydrate (GdCl3∙6H2O), N-(3-dimethylaminopropyl)-N′-ethylcarbodiimide (EDC), and N-hydroxysuccinimide (NHS) were purchased from Sigma–Aldrich. N,N-Dimethylformamide (DMF), acetonitrile, and diethyl ether were commercially available and were used without further purification. Tri-sodium-DOTA was obtained form Parish Chemical Company, Utah, USA. Omniscan® was purchased from Guerbet Co., Germany. The in vivo contrast effect was performed in normal, healthy New Zealand white rabbits weighing 3.0 kg. The rabbits are anesthetized with an intramuscular injection of Ketalar (ketamine hydrochloride, Yuhan, Seoul, Korea) 50 mg/kg and Rompun (xylazine hydrochloride, Bayer Korea, Seoul, Korea) 5 mg/kg. The final products were administered into a marginal vein with 26G-needle syringe. A solution of mPEG-NH2 (0.3 g, 6 × 10−5 mol) in DMF (10 mL) was added dropwise to a solution of PSI (10 g, 1.22 × 10−4 mol) in DMF (25 mL). The mixture was stirred at 60°C under a nitrogen atmosphere. After 24 h, the reaction solution was precipitated and filtered with diethyl ether for removal of DMF and unreacted materials. The filtered PSI-mPEG was washed with diethyl ether and dried under vacuum. A solution of hydrophobic ligand, hexadecylamine (1.6 g, 6.7 × 10−3 mol) in DMF (10 mL) was dropped to a solution of PSI-mPEG (10 g, 4.76 × 10−4 mol) in DMF (25 mL). The mixture was stirred at 60°C under a nitrogen atmosphere. After 7 h, the reaction solution was precipitated and filtered with diethyl ether. The filtered PSI-mPEG-C16 was washed with diethyl ether and dried under vacuum. A solution of ED (0.5749 g, 9.56 × 10−3 mol) in DMF (15 mL) was added dropwise to a solution of PSI-mPEG-C16 (0.21 g, 8.97 × 10−6 mol) in DMF (3 mL) at 40°C for 6 h. The prepared PHEA-mPEG-C16-ED was washed with diethyl ether and then dried under vacuum at 30°C. The resultant powder was dissolved in distilled water (10 mL) and dialyzed against distilled water with dialysis membrane (MWCO: 3,500) for 3 days to remove unreacted monomers. The powder of PHEA-mPEG-C16-ED was obtained after lyophilization. DOTA (0.7 g, 1.5 × 10−3 mol) was conjugated to PHEA-mPEG-C16-ED (6.75 g, 2.5 × 10−4 mol) using EDC (3 × 10−3 mol) and NHS (3 × 10−3 mol) at ambient temperature for 3 h. After reaction, the solution was dialyzed and lyophilized. Dried PHEA-mPEG-C16-ED-DOTA (6.87 g, 2.5 × 10−4 mol) was dissolved in distilled water again and GdCl3 (0.6 g, 1.5 × 10−3 mol) was added in this solution and stirred for 3 h. The prepared PHEA-mPEG-C16-ED-DOTA-Gd was precipitated by acetonitrile, washed with diethyl ether, and then dried under vacuum at 30°C for 6 h.
The molecular weight of PSI, PSI-mPEG, PSI-mPEG-C16, PSI-mPEG-C16-ED was confirmed by GPC (PL-GPC220, Polymer Laboratory, England) analysis. GPC had two columns (10 μm, MIXED-Bx2. 50 nm), and DMF (Aldrich) was used as mobile phase. The results of synthesis were confirmed by 1H NMR (Bruker 300, 500 MHz). Dimethyl sulfoxide (DMSO, Aldrich) was used as solvent. 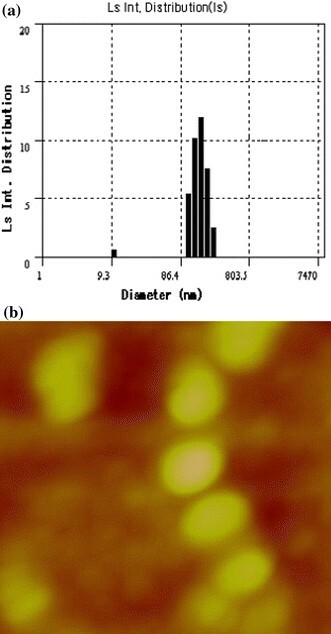 The size of micelles was assessed using an electrophoretic light scattering spectrophotometer (ELS 8000, Otsuka Electronics, Osaka, Japan) with 90° scattering angles at 25°C. The concentration of the samples was 2.5 mg/mL in distilled water. Atomic force microscope (AFM) measurements were carried out in the tapping mode with a Nanoscope IV instrument to confirm the shape of micelles. The elemental analyses for C, H, and N were carried out on elemental analyzer (Fisons EA-1108, Fisons, Italy). For energy dispersive X-ray analysis (EDS, Quantax 200, Bruker, Germany), samples were coated with carbon in carbon coating unit and measurements were carried out at 20 kV at high vacuum. To determine gadolinium content, samples were dissolved in 1% nitric acid, and the amount of gadolinium in the solution was determined by inductively coupled plasma emission spectrometer (ICP-AES, iCAP 6,000 Series, Thermo Scientific, USA). To confirm the feasibility of PSI-mPEG-C16-ED-DOTA-Gd as MRI contrast agent, we first prepared PSI-mPEG-C16-ED-DOTA-Gd solution and a commercially available Omniscan® with varying Gd concentration from 1.0 × 10−3 to 3.9 × 10−6 M in distilled water. The T1-weighted MR images of liver were performed with a turbo spin echo technique. The sequence parameters were 9.6 ms of repetition time (TR), 4.6 ms of echo time (TE), 1 mm thickness, and 256 m field of view (FOV). To get MR images of hepatic contrast enhancement, PHEA-mPEG-C16-ED-DOTA-Gd or Omniscan® (DOTA-Gd solution) was administrated intravenously to rabbits weighing 3.0 kg at a dose of 0.05 mmol Gd/kg. MR images were taken before enhancement and 5, 10, 20, and 30 min after intravenous administration. Phagocytosis of PHEA-mPEG-C16-ED-DOTA-Gd micelles by hepatic Kupffer cells was studied using electron microscopic analysis of the liver tissue. The liver tissue was taken out from the killed rabbits, fixed with glutaraldehyde, and incubated with osmium tetroxide (OsO4). In vitro and in vivo MR imaging test were performed with a 3.0-T MRI system (Intera Achieva 3.0T, Philips Medical Systems, Best, Philips Co., the Netherlands). To prepare the micelle-formed MRI contrast agent with Gd, hydrophilic (mPEG) and hydrophobic moieties (hexadecylamine) were conjugated with the PHEA backbone. PEG chains, being exposed to the external aqueous phase, enhance water solubility of micelles and allow for escaping the phagocytic systems as already reported in various nanoparticle systems. On the other side, the hexadecylamine residues can form the micellar core to stabilize nanoparticles. Finally, PHEA-mPEG-C16-ED-(DOTA-Gd) has been prepared by the conjugation of DOTA-Gd via ethylenediamine on the backbone chains of PHEA. PSI-mPEG and PSI-mPEG-C16, PHEA-mPEG-C16-ED were sequentially synthesized (28). The overall synthetic route of PSI-mPEG-C16-ED is shown in Fig. 1. 1H-NMR of PSI-mPEG, PSI-mPEG-C16, and PSI-mPEG-C16-ED are shown in Fig. 1a–1c, respectively. 1H-NMR analysis revealed a peak at 3.5 ppm that corresponds to –(OCH2CH2)n– of PEG chains and peaks at 0.8 and 1.3 ppm assigned, respectively, to -CH2CH3 and –CH2–CH2–CH2– that belong to linked C16. PHEA(polyhydroxyethyl aspartamide)-mPEG-C16-ED was prepared from PSI-mPEG-C16 via ring-opening reaction with ethylenediamine). 1H-NMR analysis revealed a peak at 1.3 and 2.4 ppm assigned, respectively, to -CH2–CH2- and –NH2 that belong to linked ED. Table 1 shows weighted average molecular weights of the synthesized copolymers determined by GPC. The average molecular weight of PSI, PSI-mPEG, PSI-mPEG-C16, and PSI-mPEG-C16-ED were 8,190, 21,000, 23,400, and 27,000, respectively. 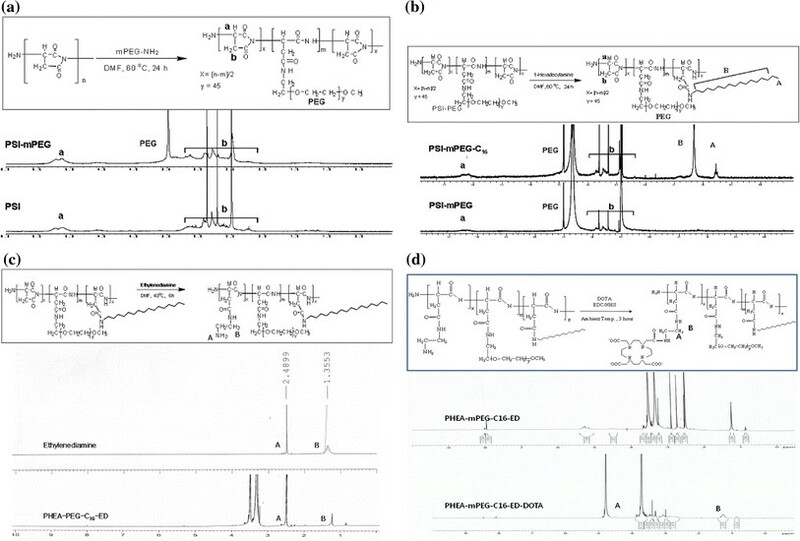 The degree of derivatization (DD) of each polymers in terms of PEG and C16 content was evaluated by 1H-NMR by comparing the integral of the peak corresponding to PEG or hexadecylamine groups with the integral of the peak assigned to PSI according to a procedure reported elsewhere. The DD values in PSI-mPEG and PSI-mPEG-C16 were reported in Table 1. DOTA was conjugated to PHEA-mPEG-C16-ED using EDC/NHS, and then Gd was chelated to PHEA-mPEG-C16-ED-DOTA. Gd in PHEA-mPEG-C16-ED-DOTA-Gd was confirmed by EDS analysis (Fig. 2). Table 2 showed that content of C, H, and N was decreased after incorporation of Gd. The average diameter of prepared micellar PHEA-mPEG-C16-ED-DOTA was 180 nm from the data of ELS and AFM (Fig. 3). That size is suitable for uptake in liver. T1-weighted MRI images of phantom are showed in Fig. 4. The signal intensity increased more obviously in phantom prepared with PHEA-mPEG-C16-ED-DOTA-Gd, in comparison with phantom prepared with Omniscan®. Image contrast showed similar patterns. These results showed that prepared sample had better contrast imaging in smaller amount more than Omniscan®. The reason seems that DOTA-Gd on PHEA backbone is aggregated closely. 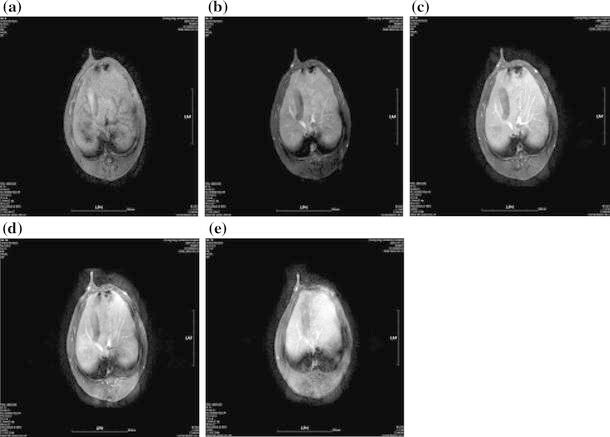 Figure 5 shows the T1-weighted MRI images of a rabbit before and at various time points after injection of the contrast agent prepared with PHEA-mPEG-C16-ED-DOTA-Gd. This result showed a profound positive enhancement of the liver after injection of PHEA-mPEG-C16-ED-DOTA-Gd. We confirmed that the prepared PHEA-mPEG-C16-ED-DOTA-Gd contrast agent remarkably enhanced the normal liver on T1-weighted MR image. The signal intensity was started increasing 5 min after injection and gradually increased up to 10 min. The signal intensity of blood vessels gradually decreased over time, but significant contrast enhancement was still visible 30 min after injection. The result indicates that PHEA-mPEG-C16-ED-DOTA-Gd can be used as good contrast agent in lower concentration of Gd and imaged for a long time or at request. Additionally, PHEA-mPEG-C16-ED-DOTA-Gd complex seems to be used as blood pool contrast agent due to high signal intensity of blood vessel 30 min after intravenous administration. Electron microscopic observation of the hepatic Kupffer cells showed that phagocytosis of PHEA-mPEG-C16-ED-DOTA-Gd by lysosomes was much greater compared to that of Omniscan®. Electron microscopic observation of the hepatic Kupffer cells showed that phagocytosis of PHEA-mPEG-C16-ED-DOTA-Gd by lysosomes was much greater compared to that of Omniscan® (Fig. 6). In this study, we synthesized a biocompatible polymer PHEA-mPEG-C16-ED and prepared micellar MRI contrast agent by the conjugation of DOTA-Gd via ethylenediamine bridge on the backbone chains of PHEA. The average diameter was 180 nm, the suitable size as contrast agent for liver enhancement. Prepared PHEA-mPEG-C16-ED-DOTA-Gd when compared with Omniscan® showed better imaging contrast in lower concentration of Gd from in vitro test. When solution of PHEA-mPEG-C16-ED-DOTA-Gd was intravenously injected into a rabbit, the T1-weighted image of the liver in a rabbit was obviously enhanced and showed prolonged intravascular duration time of about 30 min. In summary, the newly developed PHEA-mPEG-C16-ED-DOTA-Gd, a kind of micellar MRI contrast agent, had biocompatible and good in vivo MRI imaging, compared to commercial contrast agent. These results indicated PHEA-mPEG-C16-ED-DOTA-Gd complex could be considered as the MRI contrast agent for the detection of liver lesion. This work was supported by Priority Research Centers Program through the National Research Foundation of Korea (NRF) funded by the Ministry of Education, Science and Technology (2009-0093815).